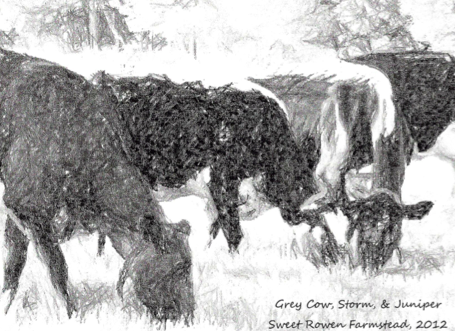 Sweet Rowen Farmstead milks a heritage landrace breed called Vermont Heritage Linebacks. 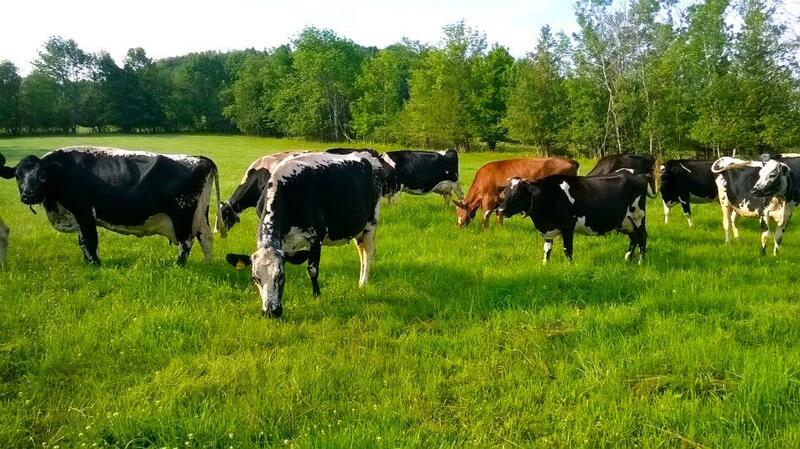 Many of our cows can be traced to Randall Linebacks, however, the majority of our herd is a regional ecotype from the Northeast Kingdom. 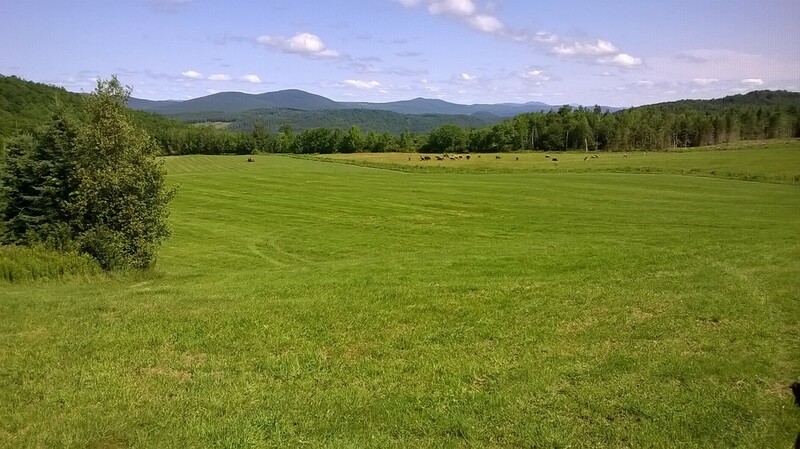 Linebacks were allowed to evolve naturally on Vermont pasture, making them uniquely suited to our native climate. Lineback cows tend to have a unique white splash running the length of their backs, as well as white splotching on the face. 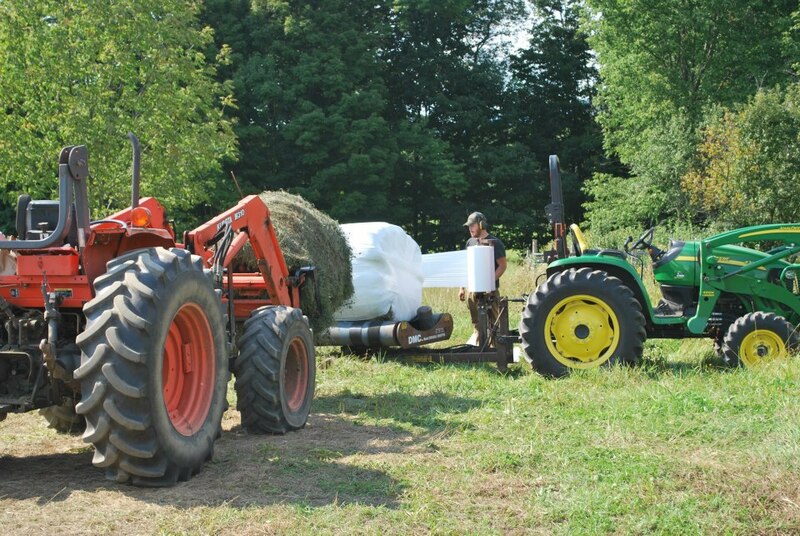 We follow a holistic approach to grazing management. 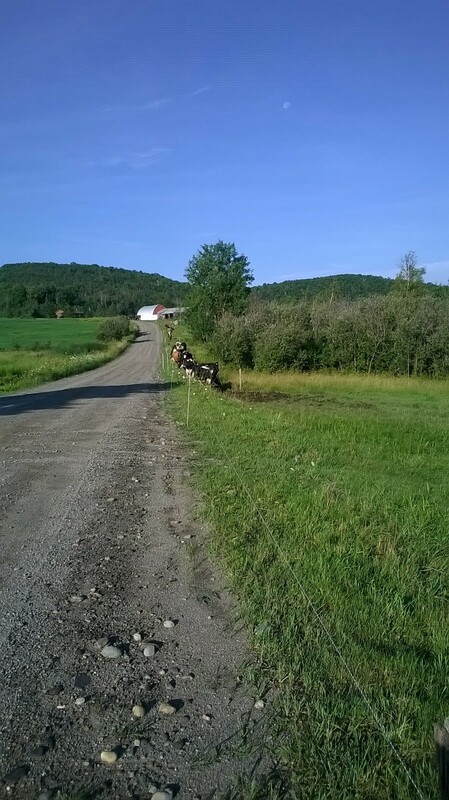 Our milking herd is moved to a new piece of pasture every 12 hours during the grazing season (May - September). 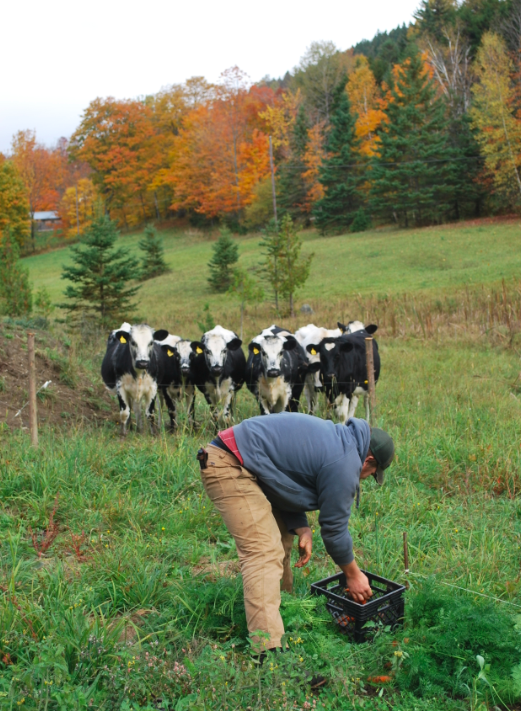 In addition to rotational grazing, we carefully manage soil fertility by amending the soil with manure from the farm and wood-ash from a local wood-fired power plant in Burlington, VT. We also frost-seed legumes to increase the soil's nitrogen content and improve the forage quality for cows. By avoiding tillage practices in our cropping, we are able to maximize carbon banking (not releasing carbon through plowing). In order for our cows to be healthy and produce balanced, nutrient dense milk, we need to feed them supplements when they come into the milking parlor. At milking time, each cow gets 6-8 pounds of a specially blended, non-GMO grain pellet blended locally by Morrison's Custom Feeds. This grain is singly sourced from farmers in Quebec within a 200 mile radius of the farm. We are not currently certified organic. 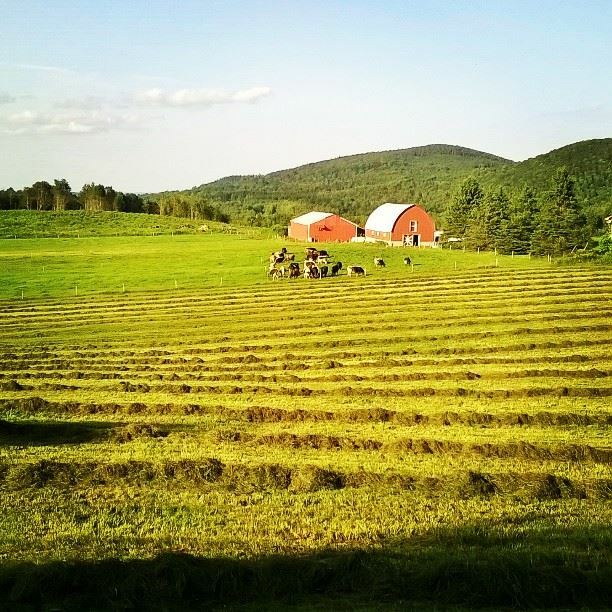 While all of the hay we grow and cut ourselves is organic, as well as the pastures on which our cows graze, we feed our cows a small amount of non-GMO grain to ensure that their diet is as healthful as possible - that grain is not always certified organic. Organic grain is very expensive and we prefer to keep our milk costs as accessible as possible while treating our cows as best as we can. Many of our other farming practices meet organic standards, often going above and beyond to ensure the most responsible stewardship of our environment. In addition, we consider our cows to be family and we want to be able to treat them if they are ever to become critically ill. Certified organic dairy cows cannot be given antibiotics under any circumstances. If an organic milk cow develops a life-threatening infection and is treated with antibiotics, that cow’s milk cannot be labeled organic - ever. Such cows must be sold or moved to non-organic herds, which we can’t support both on principle and based on our small scale. We prefer to treat our cows if they become sick, and allow them to return to the milking herd once any antibiotics have passed through their system. We never give our cows rBST (recombinant bovine somatotropin, a growth hormone) or any other hormones. During the snowy Vermont winter when our cows are unable to graze, they spend their days in the barn where a well lit sand-bedded free stall allows them to achieve full physiological expression.